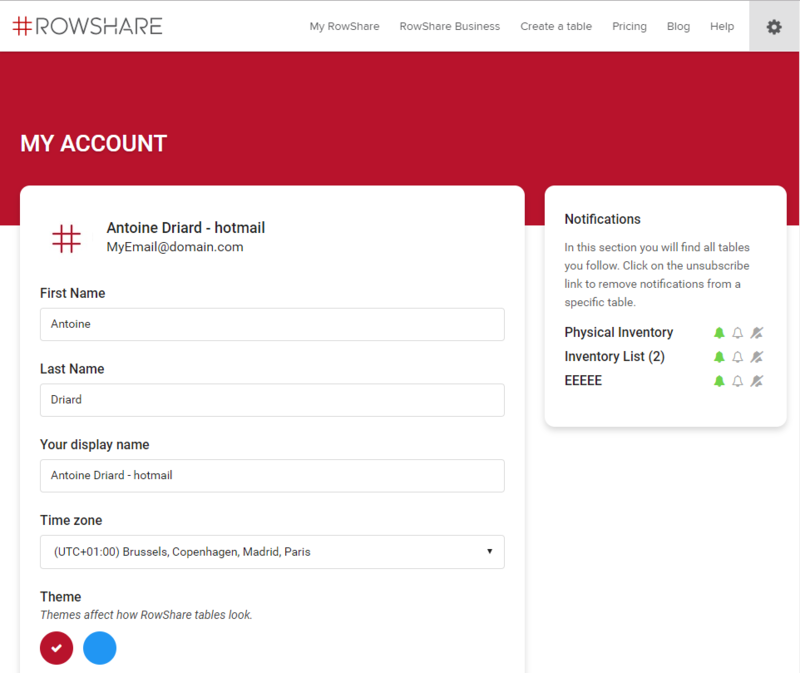 RowShare sends 4 types of notifications: System Notifications, Marketing Communications, Reminders and Table Notifications. Table Notifications let you know when you are assigned rows, granted rights or when a table you follow is modified. Whenever you are granted specific access rights on a table or a folder, you are immediately notified by email. These notifications are typically unfrequent and can only be disabled by disabling all notifications in your account. In RowShare, each row has an owner. When another user assigns a row to you, we send you an email notification. These notifications can only be disabled by disabling all notifications in your account. If you want, you can also be notified about changes in specific tables. By default, when you create a table, you follow it: the white bell at the top right of the table is full. Following a table means that you will receive email notifications when other users edit the table, whether they add, modify, comment or delete a row. The notification will specify the row(s) affected by the change. Rows are identified by their main column. Main column is by default the first column, and can be changed in the table settings page. Try to pick a column that will help users to understand what the row is about. Example: John has modified the row Customer XYZ in the table Customers. Table change notifications are grouped and sent every 15 minutes to avoid sending you an email every time a single row is changed. In the My account page, you'll find the complete list of tables you are subscribed to. You can unsubscribe from any table directly from this page. Finally, note that you can also unsubscribe from all Notifications from that same page. Except System Notifications that you can't unsubscribe from and Marketing notifications that you unsubscribe from a marketing email.